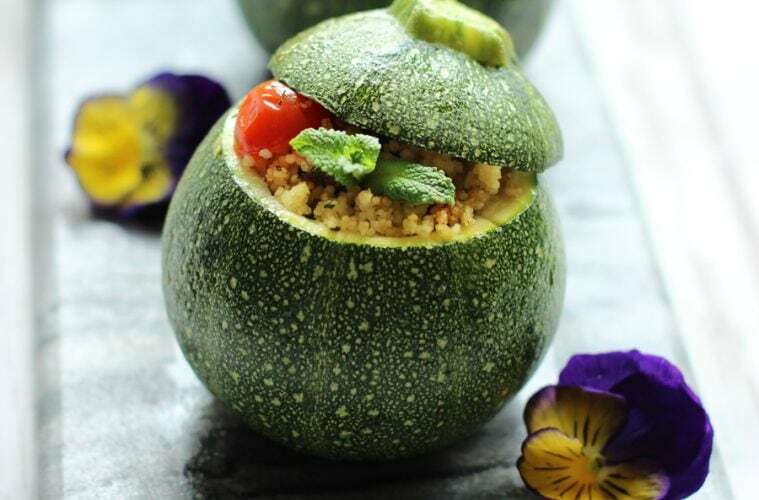 Simple flavours always win – These cute stuffed zucchini with Turkish couscous salad are naturally vegan, dairy free and totally delicious! 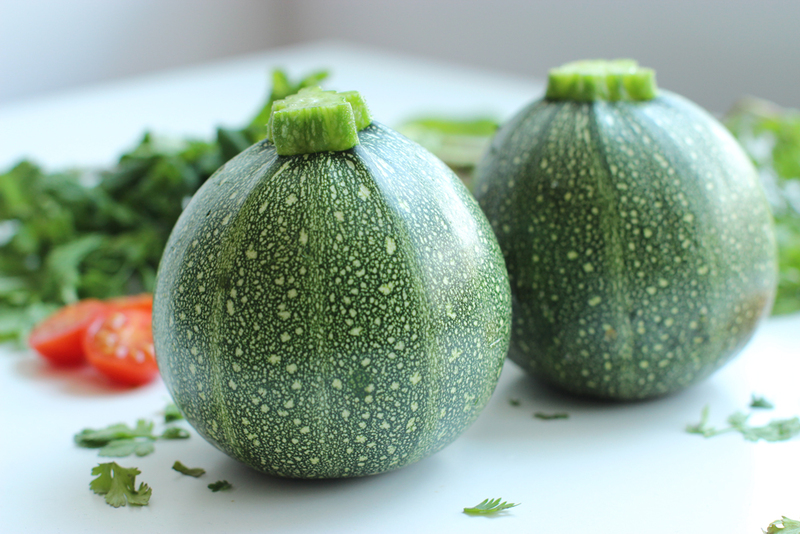 Round zucchini are shaped like adorable little balls, and tend to be denser than other squashes, so they are great candidates for stuffing and roasting. Incredibly tasty when grilled or pan-fried in thick slices, they become a tasty treasure chest for your favorite ingredients when stuffed and baked. This colorful and refreshing recipe is packed with light and healthy ingredients and makes a great vegetarian meal. Simply perfect for meatless Monday! Although you can stuff the zucchini with tons of different ingredients, this turkish-style couscous is one of my favorite way. It’s inspired by a traditional dish called Kisir, which is generally made with bulgar wheat drenched in oily tomato paste with onions, tomatoes and cucumbers and lot of mint, cilantro and lemon juice. I just replaced bulgur wheat with couscous and swapped cucumbers with the flesh scooped out from the zucchini. It’s fresh, light and absolutely tasty, and it takes less than 10 mins to put together. I love to make extra couscous salad and just enjoy it by itself, it makes a great lunch box option on busy days and keeps well in the fridge for 1-2 days. 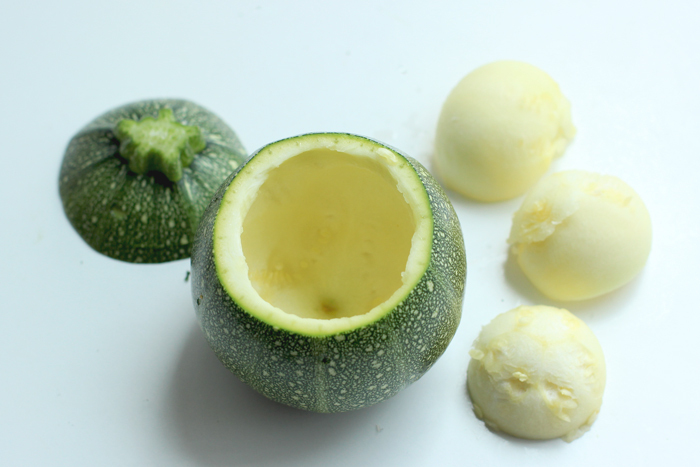 To scoop the flesh out of the zucchini, you can use a melon baller, or simply a spoon. I love fact that nothing goes wasted, the rich zucchini flesh is a great addition to the cous cous salad, and adds a nice slightly sweet flavor. 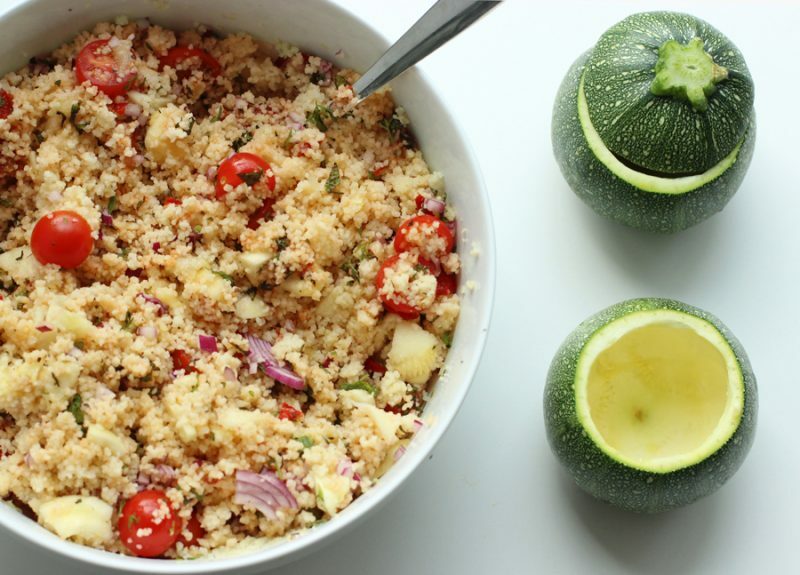 This turkish-style couscous salad makes a super tasty zucchini stuffing, delicate but with zingy refreshing flavors, low in calories and fats and loaded with healthy veggies. 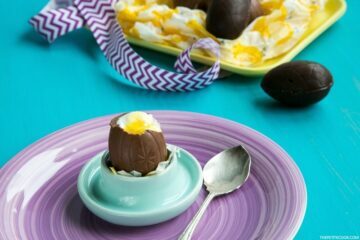 The recipe is pretty simple too, and these cute balls of yumminess are ready just in 30 min! 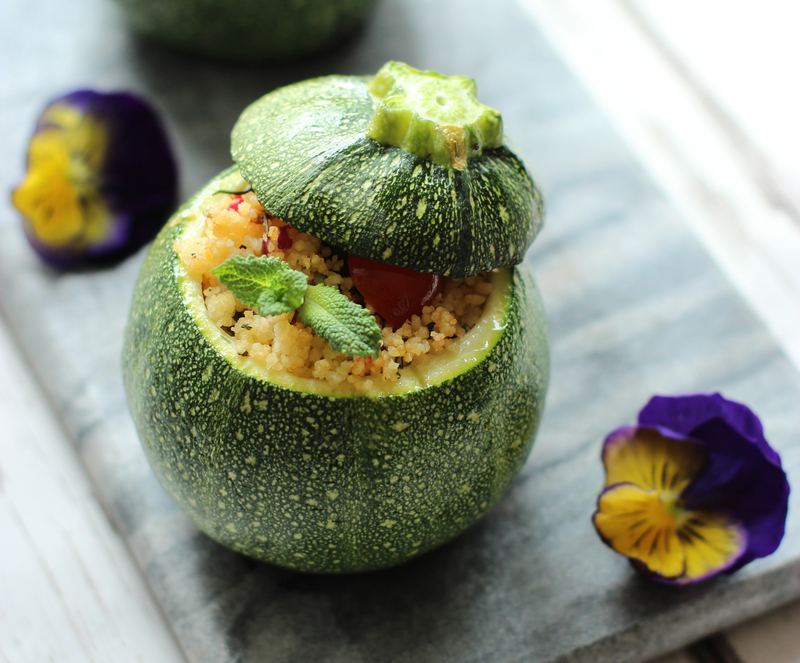 These stuffed zucchini with turkish cous cous are a perfect dish for spring. 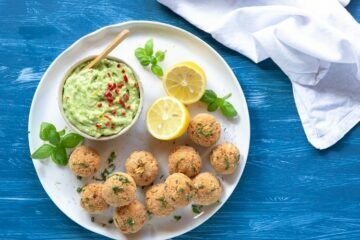 Quick and easy for a weekday meal, and great to prepare well in advance and bring at the next outdoor parties and picnics! I really hope you give these stuffed zucchini a try. If you do, make sure to comment here below or on my facebook/twitter and let me know how you liked them. 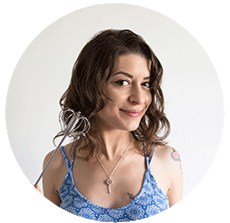 Don’t forget to snap a picture, tag it #thepetitecook and share it with me on Instagram! Looking at your pictures always makes me smile! 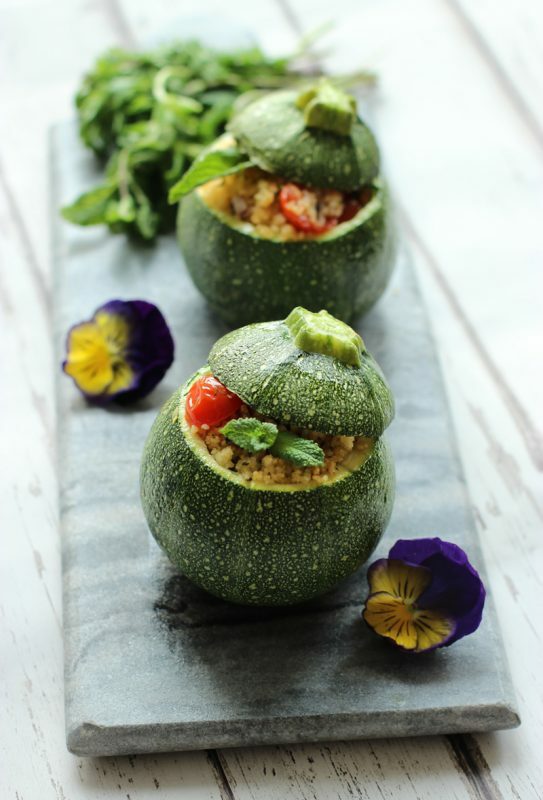 Stuffed zucchini with turkish cous cous is vegan & vegetarian, packed with light and healthy ingredients. Easy & quick recipe, simply perfect for meatless Monday! Preheat oven to 170C (fan 150C) /325F. With a melon melon baller or spoon, scoop out the seeds and flesh from each half, leaving about a half-inch shell and reserving the flesh. Bring water or stock to a boil. Pour the couscous in a bowl. Add the hot stock and stir using a fork. Cover and rest for 6-8min, until the liquid is absorbed. Once the couscous is cooked and tender, fluff it a little with a fork, breaking up any lumps. In the meantime, heat the olive oil in a frying-pan over medium heat. Add the tomato paste and stir for 2 min, then add the onion and stir all ingredients. Take the pan off the heat , season with salt and pepper to taste and mix well with the cous cous. Fold in all the remaining ingredients, then add the reserved zucchini flesh. 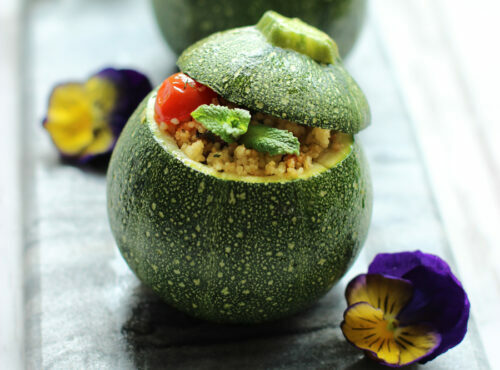 Fill each zucchini with the cous cous salad. Place zucchini and their tops on an oven tray covered with parchment paper. Brush with olive oil and bake in the oven for 20 min. 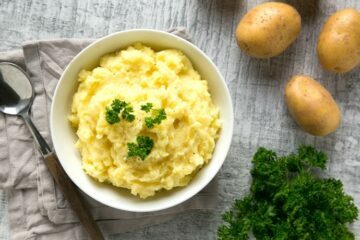 Serve hot from the oven or at room temperature. Enjoy! For more vegetarian cooking inspiration, check out more meatless Monday recipes! Oh yum! Maybe you could try with feta or mozzarella 🙂 Also, you can try the same with recipes with tomatoes instead of round zucchini ( which sometimes are difficult to find). Let me know if you like it! These are so darn cute! At what temp do you bake them? I’m not seeing it in the instructions. Thanks! Oh silly me! I forgot to add temps, so sorry! They’re all in now, I bake the zucchini at 150C with a fan oven, for 20 min just until slightly soft. You don’t really need to bake zucchini for long unless you like them very soft 🙂 Hope you try them!